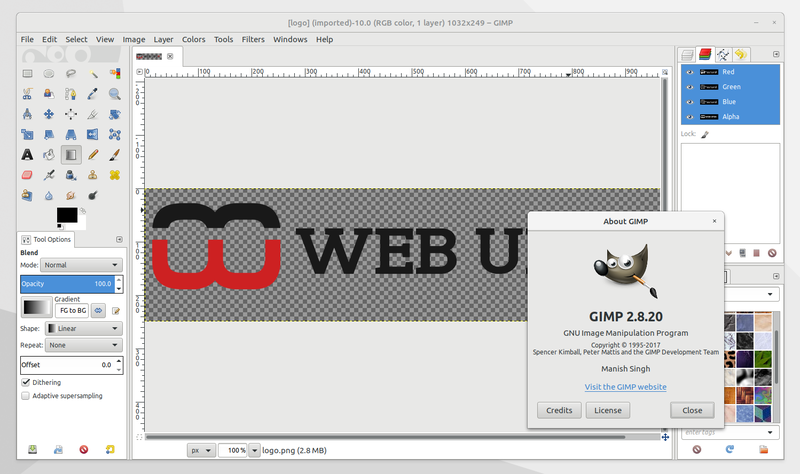 GIMP 2.8.20 (stable) image editor was released recently, bringing various bug and small enhancements, and today it was uploaded to a PPA for Ubuntu. fixed: color visison deficiency display filters to apply gamma correction directly. 2.8.x is the stable GIMP branch, and it doesn't include any new features. You may be wondering about the status of the next GIMP major releases: 2.10 and 3.0. Well, GIMP 2.10 is currently blocked by some improvements that have yet to be implemented, such as the introduction of linear workflow, reworked layer modes, and improved color management, among others. As for GIMP 3.0, the GIMP developers say that the GTK+3 port may prove to be a bigger change than expected, and GIMP 3.0 may end up switching to GTK+4. You can read more about this on the GIMP blog. For how to install GIMP 2.9.x (development) in Ubuntu or Linux Mint via PPA, see THIS article. For other Linux distributions, Windows and Mac, see the GIMP downloads page. In case you encounter issues and you want to go back to the GIMP version available in the Ubuntu repositories, you can purge the PPA using ppa-purge.